In the beginning, 2009 held such great promise. Like many of you, I was going to use the magical New Year's Day to jump start my season. It was time to hit the trainer for intervals, increase the running mileage, add in strength training and maybe, just maybe, add yoga to my overall plan. I was also going to write more and even planned on entering a small local contest to write about an epic cycling adventure. So how am I doing? Horribly! I have done 3 small easy rides for a grand total of 117 miles. No running, strength training, yoga, blogging, writing, etc. Instead, I have spent most of 2009 simply sitting around watching TV and hoping I feel better. You see, I can some up my demise this year with 2 simple words - sinus infection. After a great ride on New Year's Day, I woke up on Friday feeling a cold coming my way. I spent Saturday and Sunday relaxing, popping echinacea and watching football. This was the fine since I finished 2008 very strong and I had planned on taking a few days off to recharge. But everything changed on Monday when I woke up with sinus pressure and that's when I knew I was in trouble. I have a history of simple colds becoming serious sinus infections overnight and this proving to live up to the reputation. So I went to the doctor and 500 mg of Azithromycin later I was starting to feel better. As the week progressed my symptoms started to go away but my strength was not where it needs to be. This is what pisses me off the most about being sick. I can live with the symptoms. A little headache, running nose, and a few body aches are all manageable. It is the lack of strength to do the things I normally do that gets to me. For example, Sarah and Carmen put together a phenomenal ride last weekend. 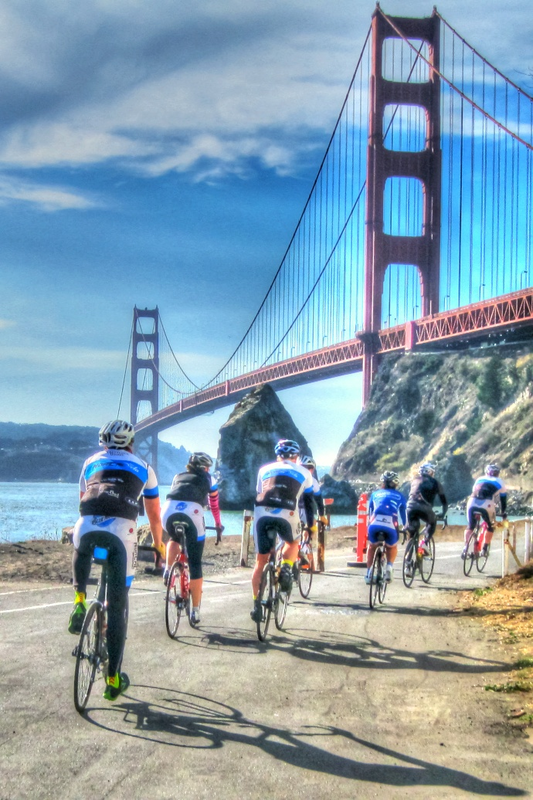 A total of 50 miles with over 4000 feet of climbing out to the beautiful Sonoma County coast. Plus, there are not enough words to describe how great the weather was that day. So what was my ride? I started with them but turned around long before the coast and managed a whole 28 miles with a heart rate that was 12-15 beats higher then normal. To see what I missed, check out Sarah's blog. I must warn you that if you are looking outside at snow right now these photos may not make you happy. Oh well, enough whining! I need to think positive thoughts and move on. Thoughts like at least I did not get sick until after the holidays. Or, at least my total lack of interest in food has helped me loose those extra holiday pounds. And finally, I need to remember that I have not been sick since September, 2007. I am still not feeling great but it will soon pass and I can begin my year the way I planned. I guess it's like they say - better late then never. P.S. If you pay attention to the map at the bottom of my blog you may have noticed that the miles across the U.S. went from almost 5800 miles to 118. That's because I reset the map each year on January 1st. Let's see how far I make it this year. Awww Lee. We all get sick at some point. I'm just glad you're resting properly so that you'll be better sooner. It's the right thing to do. Though we def missed you on the climb! There's power in them there hills!